Home Uncategorized Asian Persuasion: OMG Omusubi! If Sanrio ever decided to get into the restaurant biz, this is what they’d serve. (Oh wait, Sanrio sort of is in the restaurant biz.) So cute you could just, ahem, eat them up­, omusubi—also known as onigiri—are Japanese rice balls that come stuffed with everything from curried meats to mushrooms. In Japan the filling morsels are the omnipresent travelers’ food—like our Slim Jim—and creative moms make adorable faces with bits of nori (dried seaweed sheets) and vegetables to the delight of their school-age kids come lunchtime. 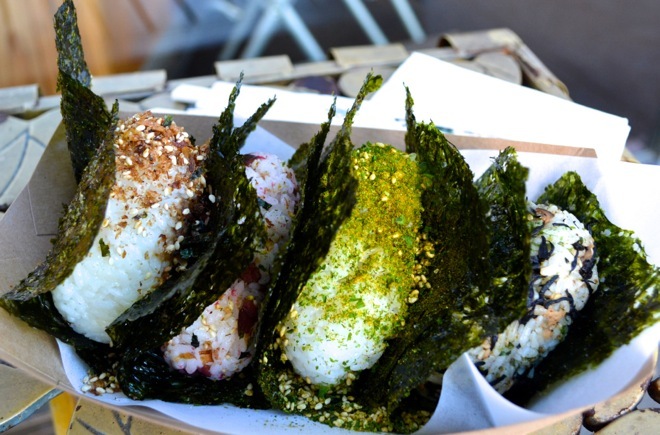 Lately, the ricey lumps have has become a trend stateside, too; the Japanese American National Museum and Common Grains recently hosted an onigiri competition, with celebrity chef judges including Evan Kleiman and Roxana Jullapat. There are plenty of local markets and restaurants that offer limited omusubi in the area, but Sunny Blue is entirely dedicated to the kooky hand-held snack. (Well, that and fro-yo.) The Santa Monica spot touts itself as the “first omusubi” spot in So Cal, and they also happen to be best, offering more than a dozen flavors including hijiki with shiitake mushrooms, the Lucky Cat with Japanese pickles, miso beef with braised meat and caramelized onions, and my favorite—Sunny Blue curry—with a choice of curried chicken or pork. The best part is watching the Sunny Spot chefs construct your omusubi before your eyes. Baseball-sized mounds of sticky rice get stuffed with small dabs of meat, vegetables, or other pickled miscellany. Next, the rice ball is given a sprinkling of the sesame seed-seaweed seasoning, furikake, and enveloped in a crunchy nori sheet. Depending on how hungry you are, two to four rice balls can make a meal. Five would just be cute overload.